This well-appointed condo is literally ski-in/ski-out with private entrance just feet from the groomed trail. Arrive in the mountains of Newry to escape and enjoy all that Maine has to offer. Ski alpine from the door step, snow shoe nearby, eat in, or at the many locally owned gourmet or casual restaurants, watch the fireworks. It is all within easy access. Our condo is designed to make your time easy. Store your skis and boots in your private hallway and don't bother with a locker or need to go to your car. Ski tickets and rentals can be purchased at Southridge Lodge, a short walk or ski down the hill. Access the main lift and get to all ski levels; this area is always open to skiing. Snowmaking at Sunday River allows you to make plans to ski, always. Back at the condo, you have two private decks to give you a front seat viewing of the mountain and the Saturday night Fireworks Display. This place is phenomenal! The deck has an electric grill and seating to be outside. Let's keep it easy: interior ski racks, storage racks, first floor private entrance; its all about relaxing and skiing. Your ultimate ski vacation on the slopes of Sunday River happens here at the Fall Line West Wing Retreat. Inside the condo, you will find a fully equipped kitchen, a living room with a view of the trail and woods, and tasteful and modern amenities. Make a big chilli to warm you up when you come home from skiing or prepare apps before heading out to a luxurious restaurant or pizza on the mountain. A new queen sized bed and a set of twin bunks are in the bedroom and all have warm, cozy quality linens. The bathroom is clean, modern, and is equipped with plenty of thick, plush towels and amenities to make your stay just right. The Fall Line Resort Complex offers two common room areas, the large area is a quiet space with a fireplace and wifi, the smaller room is ideal for children and has many board games and a television. The indoor spa area boasts a large in-ground pool, hot tub, and two large saunas. The complex is meticulously maintained and always clean. But, bring a towel! Fall Line also has its own family restaurant with a full bar, large-screen tv, musical entertainment, and two fireplaces. You can have drinks, appetizers, order out, or have a nice relaxed meal. Restaurant has a modern Italian American menu and a great atmosphere. The Sunday River area boasts numerous world-class restaurants and ski pubs. Try out Matterhorn Ski Bar on the access road. or head into Bethel and say you tried the Suds Pub! Its the best. Other restaurants include 22 Broad Street, The Camp, and The Brew Pub, The choices are limitless for a great vacation! Let our home away from home be yours. Located on the Sundance Trail, the condo leads to the South Ridge Lodge with access to the 6 man chair Chondola lifts. You can rent skis here and have lunch at the Foggy Google! more sleeping, the upstairs has a pull-out queen. Upstairs, you will find wall to ceiling hickory cabinets and warm wood features that highlight a modern kitchen with all the amenities to make a gourmet meal. The south facing deck has built in custom benches for relaxing and watching the fireworks. The living room is filled with a sectional pull-out queen sleep sofa, a flat screen TV, additional storage space. You can curl up and read, watch TV, go to the indoor pool and sauna, or hit the nightlife. This is Your vacation. Make it happen here. Steve and Maureen have owned this condo since 20046and love skiing here! They renovated the condo to be all about skiing and making it easy to get on the slope. Consistent updates and maintenance ensure that your stay is always right. Because it is all about skiing and being honestly on the slope. The private first floor entrance opens to the hallway where the skis are stored privately. No need to go to the locker. Ample storage, great beds, quality linens, clean, and everything that is expected in a high-quality rental is found here. Its a sweet place. The easy storage of ski equipment and the private entrance from the ski slope plus the two outdoor decks make this a great location to be on the Sunday River mountain. The complex is located in the middle of the 8 mountain peaks giving this easy access to get to all 8 peaks.! This tastefully decorated bathroom is equipped with many towel holders and storage area for personal toiletries to make your stay comfortable and relaxing. Of course, there is a full shower, full tub and has all been renovated. Sunday River Resort; plenty of on-mountain activities: fireworks, ski, skate, snow shoe, hiking, biking, leaf peeping. The scenic and quaint town of Bethel is just 5 miles away. Go shopping or find a restaurant! Many beautiful Maine mountain lakes are close by for fishing, swimming, and water sports, ice fishing. Sunday River is nearby. Did you know there is a real river called the Sunday River? This condo looks at the trees and trails and fireworks at night. First floor condo unit with private entrance from courtyard. Groomers come into courtyard which connects to Sundance Trail. Sundance is just above Southridge Main Lodge. Hang your skis in the condo, take them off the hook, place on the snow, at the lift in 20 seconds. Fresh cotton sheets and towels. On site laundry room that uses American quarters. Lovely sectional with large bay wiindiw and deck that overlooks the woods trail. Modern kitchen that has been updated with quality top to bottom hickory cabinets. Appliances include microwave, coffee maker, crock pot, modern flat top stove and oven, cooking spices. The complex at Fall Line has common room locations housed with additional television and games and is located off the pool area. Yes, we even have a large courtyard area that is big enough for the snow groomers to come and groom. We have two decks: one lower and one upper with privste entrance to condo. Skis and snowboards and all the necessary gear can be rented at Southridge Lodge or at any of the many locations on the access road. Pool and spa area include large, indoor pool, hot tub, and sauna. All areas are meticulously cleaned and monitored by security staff. Pool is accessed through inside if condo. This condo was so cozy for our family of 4. Perfect Slopeside location and is so convenient to be able to leave all your equipment right inside your door instead of dealing with ski lockers. Loved the second story deck and being able to watch the fireworks from right there. Maureen was so accommodating when we considered changing our check out time because of weather. We will definitely be back! Very nice, well appointed condo. Very convenient -- can ski right out the back door, no need to use ski lockers. Attentive and gracious hosts. Our family of 5 (3 boys ages 14, 12 and 8) stayed here during February vacation. We couldn't have asked for more. Perfect ski in and ski out location. Clean and fully stocked condo with everything that you need for the kitchen, bathroom and bedrooms. Can walk inside to small indoor pool and restaurant that had fantastic food and bar. We actually ordered take-out from Frank's one night so that we could do a few runs at night before the slopes closed. You can see the fireworks right from the window or balcony. So fun! Fits 6 comfortably. Plenty of room for skis and boots and plenty of hooks for drying wet clothes. Hope we have the opportunity to stay again. Thank you so much!!! We love to share our home away from home with families like yours! We hope you come again and stay at Fall Line! Walk out the door and onto the slopes. Condo was clean and comfortable. Owners were accessible and responsive. A nice cozy condo to suit all your needs. Wonderful location for ski in and ski out, and Maureen was very friendly and made the process very easy. Celebrated my husband's 40th birthday and hopefully we will back to celebrate more birthdays in the future! The Hassets keep a very nice condo. The location is fantastic, truly ski in/out. We will be back. This lovely condo is literally ski in/ski out with its own entrance to the groomed trail. Catch first tracks from the famous Chondola lift which is one minute away on skis giving you access to all the trails on the mountain, travel from White Heat to Barker, up to Spruce, to Aurora, Oz, and Jordan, and make your direct descent back to the condo, through the woods, to have lunch on the deck. Apres ski, take a dip in the indoor pool, relax in the sauna, before heading out to get some nightlife or cook inside with all the amenieites you need. Watch the fireworks from the deck as the kids sled on the mountain. This paradise is a winter lover's dream come true. Other Activities: Zip line, mountain biking, river swimming, hiking, road biking, canoe, kayak, gem hunting. 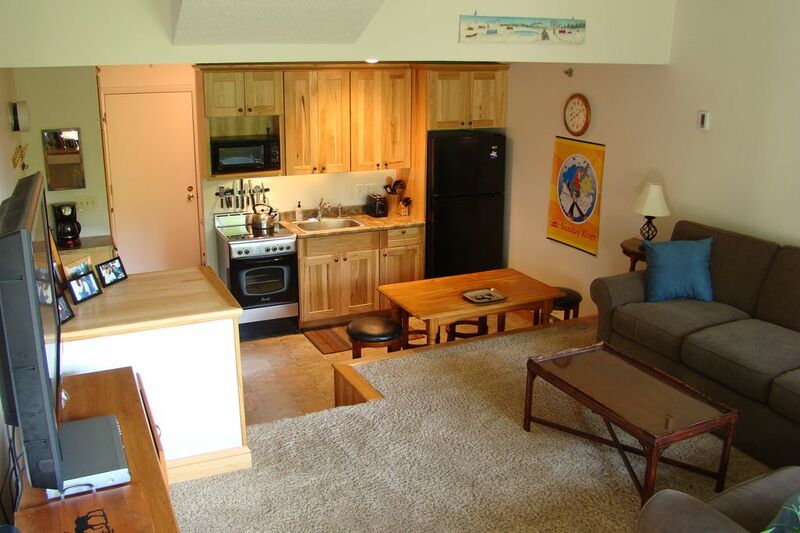 Ski: This luxurious condo sits on the slope on Sunday River, Newry, Maine. SR has 8 mountain peaks and its snow makers are famous for guaranteeing good skiing. Groomed trails, powder, bumps, advanced terrain. Sunday River has the Perfect Turn program for beginners and advanced terrain such as White Heat, the steepest, longest trail in the East. In addition, it is known to be the first mountain open in the east with its superior snowmaking. The new Chondola is the first in the East and takes skiiers and riders to the top of North Peak where the lodge awaits you, both during the day and at night. Sunday River offers superb Perfect Turn clinics for all levels and abilities for both skiiers and riders. Night skiing is awesome - ski from 8:00 am to 8:00 pm and is located directly outside the condo. When you get home, watch the fireworks from your deck at Fall Line West #112, your skiier's haven and paradise.